The Disk Utility app has long contained the ability to verify and repair disk permissions on a Mac, but in the latest versions of OS X this ability has been removed. That doesn’t mean you can’t verify permissions and repair permissions in OS X El Capitan 10.11 and later however, you just need to turn to the command line to do so. To be clear, verifying and repairing disk permissions has long been over assigned as a remedy to all sorts of issues on the Mac, most of which are rarely accurate or legitimate. In this sense, repairing permissions is sort of considered a form of hocuspocus with little benefit to most OS X situations, but nonetheless there are some unique circumstances where you may want to verify and repair disk permissions in OS X anyway, particularly if a files permissions are actually off, meaning the ability for certain users and processes to read and write particular files and folders. Note this is not the same as verifying and repairing a disk. Permissions differ on "usr/libexec/cups/cgi-bin", should be drwxr-xr-x , they are dr-xr-xr-x . Permissions differ on "usr/libexec/cups/daemon", should be drwxr-xr-x , they are dr-xr-xr-x . Permissions differ on "usr/libexec/cups/driver", should be drwxr-xr-x , they are dr-xr-xr-x . Permissions differ on "usr/libexec/cups/monitor", should be drwxr-xr-x , they are dr-xr-xr-x . Repairing permissions may take a while, just like it did from Disk Utility. --help Print this usage guide. --list-standard-pkgs Display the package ids in the standard set. --verify Verify permissions on files in the specified package(s). --repair Repair permissions on files in the specified package(s). --pkg PKGID Verify or repair the package PKGID. --standard-pkgs Verify or repair the standard set of packages. --volume PATH Perform all operations on the specified volume. --output-format # Print progress info using a special output format. --debug Print debuging information while running. As suggested, this is not really something that should be run on a regular basis as any part of Mac maintenance routine, and it’s rarely necessary, which is likely why Apple pulled it from the Disk Utility application. By the way, earlier releases of OS X also have a command line approach to repairing disk permissions, but it’s handled through the Disk Utility command line tool instead. I hate the new Disk Utility, it’s harder to use for everything and offers less information. Plus, the Debug menu doesn’t work in OS X El Capitan anymore in Disk Utility, has anyone figured out how to enable that so we can see hidden partitions in Disk Utility for OS X 10.11+ ? That would be nice to know. Repairing disk permissions is really only needed if you have just installed and uninstalled a whole bunch of stuff, never really necessary beyond that in my experience. I disagree. Dozens of times I ran across folders, files etc. that wouldn’t allow me to open because I didn’t “have the authority”, even though I created those files etc. Used the permissions repair to take care of the problem each time. I just plugged that line above into terminal and a big warning came up about improper use of SUDO could cause all kinds of problems. I don’t need more problems with the computer, I need less. Well sure, if you just installed and uninstalled a whole bunch of stuff. I mean, it’s always stuff that causes problems. Sheesh. It’s this kind of baloney that made me glad El Cap removed the function from Disk Utility in the first place. Riiiiight. The kind of baloney that doesn’t affect you and that you don’t use and is unobtrusive makes you glad it’s been removed. Jeez get over yourself. They’ve reduced functionality – that is NOT a good thing. It’s not just permission repair that has suffered either. I’m glad Repair Permissions has been removed because for over a decade it’s been dragged out as the first line of troubleshooting for any issue, no matter how unrelated. Now with El Cap, the few remaining locations that have the potential to be “fixed” get a sanity check when the installer is run, and those locations are no longer user-modifiable anyway. Really, the function lost its utility ages ago when we stopped running Classic, and old apps running in the Blue Box stomped on permissions without knowing any better. But by all means, fire up the terminal in El Capitan and repair away. Just realize you might as well be waving a chicken over the keyboard for all the good you’re doing. Until you try and run a Hackintosh and you need to repair permissions and rebuild the kernel cache. Lets not forget mounting EFI partitions and a slew of other things that are handy to power users. You come off like you know things but its obvious you don’t know “everything”. If you don’t want to repair permissions then don’t but it doesn’t change the fact that the command was useful for certain power especially in the “hackintosh” realm. I have to seriously disagree with all of the comments that claim repairing permissions does nothing. I’ve been looking after Macs professionally for almost 30 years and it’s an invaluable asset. I have seen hundreds of Macs that have been reduced to a crawl because of permissions problems, most of which look completely irrelevant at the time. So when Macs speed up as a direct result of repairing permissions there is no doubt at all that it has an important function. To claim that Apple removed the function is to ignore the fact that they are still repaired every time a system update or upgrade is carried out. The reason? Most people don’t repair permissions at all because they don’t know about it. By making it an automatic procedure doesn’t mean that it isn’t needed and that Apple have dispensed with it! At least now the silent majority will have their permissions repaired once in a while rather than never… or until they come to see me. couldn’t agree more!! Bring back the old Disk Utility please. For those saying Permissions Repair is smoke and mirror I say nay!! I support about 150 mac computers and I’ve literally watched Permissions Repair fix many a problem including software not installing, not being able to install a printer properly, not being able to access files, and not being able to LOGIN to Mac OS. Hard to get on board with it being smoke and mirrors when I’ve literally seen it fix these problems several times. I highly highly doubt all those problems will magically go away in 10.11. I am just a simple Mac user for many years and I love the old mac operation system, simple and extremely efficient. I use Logic Pro 8 and sibelius6 mostly…works perfect for my”applications” I don’t need much more than that.. I just can not understand why the newer Macs have been made less functional and more undependable……..
very sad to me….. I feel apple isolating themselves, in a sense, but keeping it less useful to people like me who don’t get into the complexities of the Mac but who truly depend on it consistent and dependable functionality…..
thanks for all the informative post..
they shed a lot of light on all the present day issues and confirmations with these computers..
Onyx does this and more in an easy to use interface. Thank you for the Onyx tip. I’ve been having a lot of permission issues lately, I hate the new disk utility. Another useful utility, venerable, frequently updated, checks and repairs permissions on El Cap. I admit, sometimes verify and repair fixed problems in earlier OSs but I still don’t know why, at this point in the Mac history, disk permissions are such fragile things. Was verify and repair alway hokus pokus? Why wasn’t it routine and run in the background? I’m not a programmer but I’ve owned Macs since the 128k. I would love to see an answer. Because all it does is correct permissions that were set incorrectly, if the problem wasn’t permission related (read or write access to a particular file) then it wouldn’t do anything to benefit. I’m confused. I rarely want to protect a document beyond a log-in as a user. So if I don’t set permissions what sets them incorrectly? File permissions are set by the user, by apps, by the system, etc. It’s advanced stuff that’s well hidden from average user so they don’t mess something up. This is why repairing permissions isn’t that relevant to most users, they rarely modify permissions to begin with. do you think Apple is hearing this and caring enough of it’s loyal users, high level or low level users to make a difference…..? BTW… it’s only in this area. Other topics not affected. Be very careful with this command. I ran the command and permissions were changed on my Canon scanner. When I tried to scan, my MBP hung and I couldn’t even force quit it. I had to fully uninstall my Canon scanner and then reinstall it again. Not even a comment mentioning that OS X El Capitan is removing “Fix Disk Permission because it is automatically protected by the new rootless security model”? Thank you guys! I got a strange effect after latest update to el cappitan 10.11.1. Since then middle row on the keyboard stopped working.nJust letters, not those : and ;. Apple Support was useless as always. I had the same problem with yosemite, but there were only couple of keys. So repairing permissions helped to solve it. But in el capitan it is a little bit complicated. So your advice is the cure! Thank you very much. By the way, Onyx did not work, Clearmy mac3 too and other b soft as well. While fixing permissions didn’t do much in the big scheme of things, I found it regularly fixed issues of slow booting and applications that would crash. Obviously every installer program didn’t do a very good job of setting the permissions as Apple would see fit. Not unlike the Windows Registry. Both systems have become so bloated that you have to be a command line wiz to clean-up the mess they’ve made of installing programs! @Ryan Gao, surely if SIP is active, there should be no possible way for permissions to go wrong. Any permission that the tools reports as incorrect indicates that there is a security hole for the jail-breakers and malware authors of this world to drive a bus through. Whatever mechanism bypassed SIP enough to alter permissions (to an incorrect value) is potentially something that can be exploited. I’m gob-smacked that the tool remains on disk – it seems an admission of failure, since SIP is supposed to mean “nothing can go wrong” in this space. No possible way? What about target disk mode? Bottom line is this utility can still useful in some situations, and having it available does no harm if you never end up needing it. A quick way to repair file permissions in OSX El Capitan is to manually download the latest OS update from apple, and install it (or re-install it). There’s no need to re-install the whole OS to fix permissions. 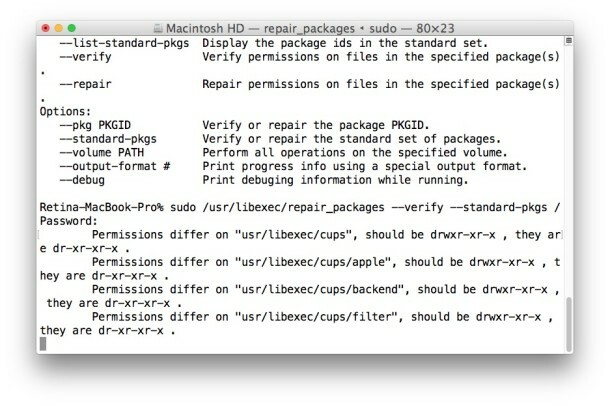 Does OSX El Capitan repair / verify permissions when updating? Thanks in advance for any input. Is there an application (GUI) to repair permissions on Mac OS X 10.11 El Capitan? 2. run this command again and ?? That is because this command does not repair permissions in El Capitan. as listed in the article does. Sorry, delete that last post. I thought I was replying to another. Some “permissions” are not. Instead, they are info only. These will not be repaired as there is nothing to repair. SUID, for example. “ACL found but not expected” is another. SUID and ACL messages are benign but can be removed. The comments that Repair Permissions is always unnecessary is not true — as any Digital Performer user can tell you even in Yosemite. Certain builds of Finale required it too. Just one of those things. I like Onyx and Cocktail but not for the reasons one might think. Neither actually fix anything but they do allow people to so totally screw up their systems that I get to charge for my time to put Humpty Dumpty back together again. DiskWarrior just does nothing except take your money and waste your time. That is about as clueless reply as I’ve ever seen! DW does nothing? Really? Are you a Windoze troll? Unbelievable… unless you like charging people for manually trying, and failing, to put things right! How about it bringing up dying drives in Preview mode so that data can be recovered with a minimum of time and effort? I have no idea how many times that has saved customer’s data when file recovery software, of which I have several versions, would have taken a lot more time and cost. “Diskwarrior does nothing” Obviously you have NO idea what you are talking about. I fear for anyone unfortunate enough to have your inept and incompetent self bumbling through their system then slapping them with a hefty bill for your confused tinkering under the guise of a repair tech. Please leave computers alone and go back to your job writing those irrational and illogical furniture assembly manuals we do love so much. Another option is to use the old Disk Utility from Yosemite to repair permissions. It still works on El Capitan. OOPs. I was wrong. The “Repair Permissions” button is greyed out in the Yosemite version of Disk Utility running on El Capitan. Back to the command line or Onyx etc. A fine example of fixing something that was not broken and reducing ease of use. Sure, you don’t need to fix permissions often but when you do, it’s not the time to be googling “where the hell did Apple put verify and repair”. ok, so it’s useless.. so what’s my answer then? I ended up on this page because i’m having errors like “illustrator can’t save the preferences file because it’s locked or you don’t have permission to write…”. I haven’t done anything manually, so what should i do instead of repairing permissions when i have problems with.. er… permissions? Because the perception is that repair and verify permissions is not a very beneficial tool for the masses, Apple has done what they do best and attempted to clean up the interface in an effort to approach the ultimate “Easy Button” solution because all other problems you may encounter are taken care of for you when your not looking. Future OS X releases may eventually just have a green Fix button once they simplify it so much. Besides any serious tech loves the command line and would prefer that to a GUI right ~sarcasm? Even if the fix was a placebo, why not leave it if it makes people feel like they did something to help their problem. I bought a new iMac 5K retina display with OS X El Capitan in November 2015. A problem has occurred with the licensing of this product. Restart your computer and re-launch the product. From the forums and chat line suggestions, I was told that it is a “permissions” problem. I have tried uninstalling and re-installing. After unsuccessfully trying to sort this problem with Adobe chat, the final suggestion was to create another user account and then try to activate it. I set up new user account but still had same message, Then used safe mode – still same message with photoshop. So I uninstalled the cd of Photoshop CS5, and opted to subscribe to Adobe creative cloud on a monthly basis. I got the same error message so could not open Photoshop, had to get money refunded. I have been using Photoshop for 15 years, to make the prints that I was selling. I have had online chats with Apple and with Adobe, but not yet found anybody who can enable me to open Photoshop. I have put my query to many forums, but am at a total loss what to do next. COULD ANYONE HELP or advise PLEASE. I think the real reason they removed Repair Permissions is that , among all the other things that have been getting screwed up in the operating system, it was getting to the point that instead of there occasionally being a few things that got repaired it has now for a long time been common for there to be an endless list of repairs that takes forever and just keeps coming back every time you run it. It makes the unaccustomed user very nervous. Those who have seen it over and over, we were just getting used to grunting and gritting our teeth. I feel so glad Apple removed this (not)! I had 8 pages of permission repairs.. Who needs to see any of that! It’s all just nonsense, like global climate change. Repairing permissions once or twice a year will help you Mac run smoother and faster and to perform as expected. If you use a Mac as a testing ground and are constantly installing and removing software, then you might even need to repair your permissions quite regularly. The issue, I believe; is those people who have made the jump from a Windows environment to an OS X environment. They come with a whole load of baggage and tend to think that repairing permissions is akin to defragmenting – which of course its not but Windows migrants come with that mindset – defragment, reorganise, reinstall, empty caches on a regular basis. Basically, running the same maintenance workflow on a Mac that they did on a Windows PC and completely misunderstanding what they are doing in the process. So yes, I am pleased that Apple has removed this feature from the GUI but I am glad they have left available via the Terminal. Those of us who need it can still run as and when is necessary and the migrant crowd will still get their permissions repair automatically, during upgrades/updates. To be honest, I kind of wish Apple would remove all maintenance tools from the GUI and make them Terminal only because so many people run these things without understanding what they are doing with them or what they are for. There are legitimate reasons to verify and repair permissions. If you use any audio or video app that accesses the Library/Audio/Plug-Ins/ directory, over time and for various reasons permissions will differ and applications WILL CRASH before they get through the verification process. Those users will need to repair permissions. About DiskWarrior.. I don’t use it much anymore, but in my IT days it SAVED MY ARSE on more occasions than I can remember. It was the only app back in the day that was reliable enough to work almost 100 percent of the time. And it didn’t BS around. DiskWarrior should be in the Mac app HOF! This is not some minor glitch and I don’t want code hocus posts to fit it. OS X screwed up and it’s telling me that I do not have permission to open 100,000 of my own photographs on my own computer. This is serious and there is something seriously wrong with OS-X 10.11.5 that caused it to happen. Apple needs to make an app that undoes this error then add whatever is needed to Disk Repair to apply that fix. Repairing doesn’t help in a long run as Safari 6’s permissions get repeatedly corrupted. And yes, I had reinstalled Lion together with Safari – to no avail, so I’m bound by the necessity to repair permissions which is annoying and is definitely a bug which never got enough attention even among users (perhaps being the reason why it wasn’t fixed during all Safari 6 support cycle). I upgraded to El Capitan and subsequently ran into all sorts of trouble with iTunes and an NFS share. I had resorted to reinstalling both iTunes and El Capitan, neither of which solved my issue. I was getting the “You do not have enough access privileges for this operation.” message when I launched iTunes. I also could not login to iCloud or the iTunes Store. When I tried to login, I got the “This action could not be completed. Try again.” message. I was able to login at icloud.com so I knew my Apple ID was okay. The repair_packages command found that the ACL was completely missing for iTunes and also that the permissions for the /Users/Shared folder were incorrect. Running with the –repair option fixed my problem. Just leaving this note here in case anyone with the same issue searching around. After reading some of the comments on here. I must state that if your Mac has an issue its very likely that YOU did something to mess it up. I have provided tech support to Macs and PCs for over twenty years and its funny how people are always trying to blame the OS. On the other hand, if your issues are with iCloud: Apple has no doubt messed that one up quite a few times (fact) Use Google to back your photos up instead of iCloud. If your pictures lost their permission,and they are local copies…its an easy fix. Go to the folder that holds the pictures: change the permissions to give your admin user read and write, then click the gear and choose apply to enclosed. BTW, this works for any type of file. Sure you could just fix that one path but the cli repair works too. Begs the question why aren’t the dot upgrades fixing this issue if permissions get auto repaired? I hate the new Disk Utility. Having more functionality is better. The move to gradually hide and bury more and more of OS X’s functionality is really annoying. What I used to be able to do as a power user now forces me to be a light-weight developer to accomplish. It’s getting to the point of being tougher than Windows to get stuff done. My only guess is that some lamo security tech got laid off from Microsoft, and then somehow sold his ideas of security to Apple – and then completely demolished the old security paradigm that made Macs so awesome. How do you write the code to verify external drives exactly? Kindly provide the line please? Thank you. Which / in the command line to specify a different drive than my Mac Drive? I want to repair permissions on an external drive. Is there anything that can be done in this situation or should I basically format the computer? 1) boot off of an external os x disk, stick, or (maybe) the recovery disk. 2) make sure your boot disk is not the internal disk. 3) sudo:chown the /internal_disk/etc/sudoers to 0 (root) or root:staff, root:wheel, or root:admin. I’m not as technically as most here, or maybe half of the posters because “repair permissions” seems to be a love it or hate it proposition. After recently updating to El Capitan, I get screen after screen asking for my password because the OS needs to repair a permission for this or that. After several days, it is happening less often, but I’m sick of it. I must have done it 50 times right after the upgrade from Mt Lion. Now, when I open an app for the 1st time in El Cap, there is a 50/50 chance I’ll get that annoying message. What is up with this? If SIP means no need to repair permissions, why is it constantly making me enter my pw to repair? How do I stop the permissions correction from “correcting” my Java install? A while back I stubbed out and symlinked all the OS X Java stuff and set up a proper Java install. Ever since “repair permissions” whacks Java. How do I stop the permissions correction from “correcting” my Java install?